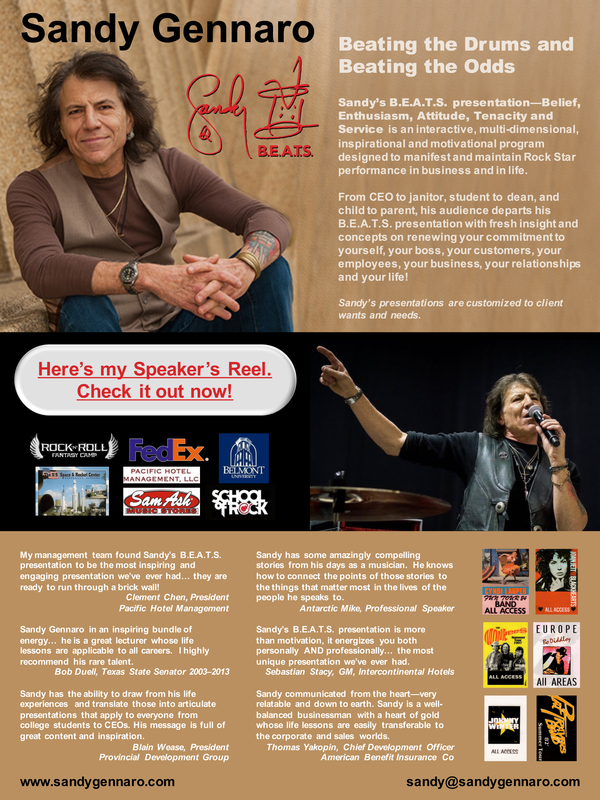 I draw on my 1/2 century of successfully navigating the murky, shark infested waters of the music business to illustrate how to achieve and maintain Rock Star status in business and in life. From janitor to CEO, salesperson to customer, parent to child – I will illustrate success tactics and thought process’ that will leave your audience energized, inspired and motivated to successfully achieve the goals that lie ahead. “Beating the Drums and Beating the Odds”…….B.E.A.T.S. (Belief, Enthusiasm, Attitude, Tenacity and Service) – I drive home these vital ingredients of success via behind-the scenes-stories and interactive drumming performances, making for a truly unique, memorable, meaningful and life-changing experience for all attendees. They WILL NOT be disappointed – I guarantee it!! !